After Lombok I went back to Bali, and headed to Gilimanuk to transfer to Java via ferry. I spent four hours on a ferry from Lombok to Bali and then four more hours getting to Gilimanuk on a local bus. I was guided by the guy who rented me a scooter to Lombok. He took me to the bus station and told me to listen to no one and to look after my stuff. Leaving me in the middle of the bus station chaos, he waved goodbye and evaporated into the crowd. I was surrounded by millions of eyes and scammers hungry for white meat, who wanted to rip me off by selling me a dodgy ticket. Travellers can face similar situations in China when alighting from the train station or airport and get attacked by taxi drivers harassing you, pulling you by your backpack or hand. Here people try to mislead travellers by offering them their services — they’re best to be ignored. I asked a security officer for help getting to the port and he pointed at a yellow ramshackle bus, which was going to Gilimanuk. I bought water at a local kiosk and with the accompanying looks of the locals I boarded the bus. There is one single lane road that goes to the west from the southern part of the island. It is bumpy and long. 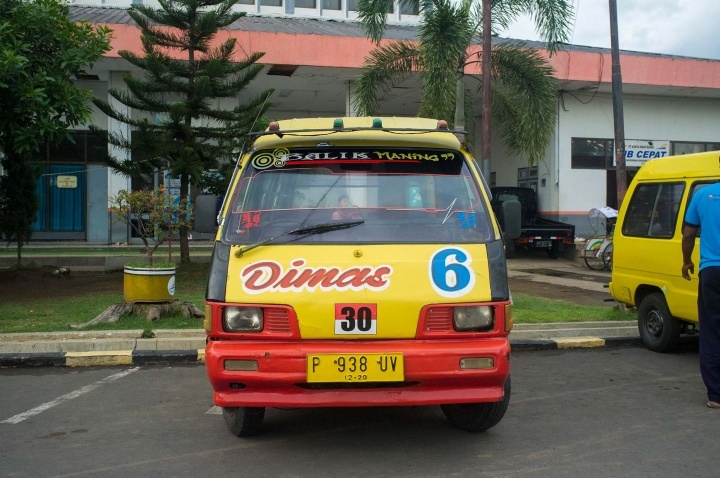 Indonesia is very hot, even for locals; doors on local busses are left open to allow some air in. People in Indonesia often litter where they stand, whether on the bus or on the street. People in China have similar manners, but Chinese public transport is fitted with bins or buckets, which they use for throwing rubbish or even spitting. Here, people chuck garbage on the floor or outside through the open door of the bus. On the bus I met a guy named Kharisma (there was nothing charismatic about him except his name). He was very calm and smiley; he spoke a little English and we discussed his hometown of Jogja. He told me about his hard work, poor income, his family and his plans to work in Saudi Arabia as a baker. He was also curious about me travelling alone and by local bus, to which I replied that it’s the best way to experience the life of local people. When we arrived to Gilimanuk it was already evening. 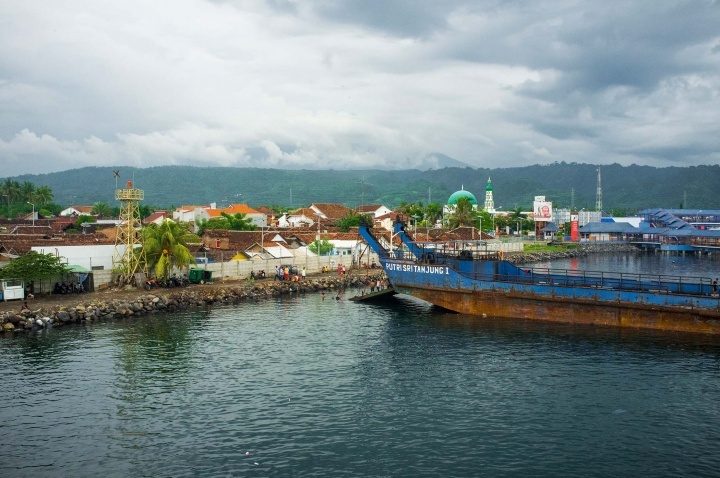 Gilimanuk is a quiet and laid back port town in West Bali. Unlike the rest of Bali this town is predominantly Muslim. Muslims migrated here from Java, established a community and are now finishing building mosques. 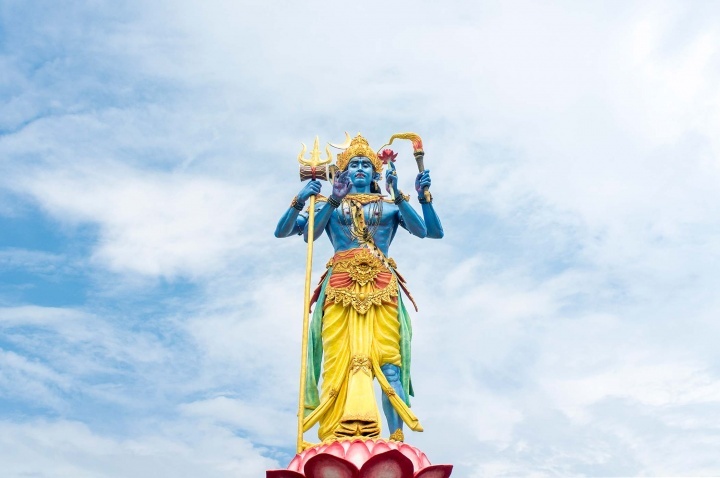 Regardless of that I found a large Hindu statue of Lord Vishnu next to the port — pretty intimidating. Gilimanuk port, Bali, Indonesia. Vishnu is one of the three main male gods of Hinduism. Along with Shiva the destroyer and Brahma the creator, they are together known as the trimurti. Being in a large port town I was expecting long queues and extensive checks. However we were the only people crossing the gates. Kharisma bought tickets, we passed security and went straight to the ferry. The interior of the ferry was somewhat bizarre. It resembled something between a police department waiting room and an old fashioned hotel cinema. The walls and ceilings were fitted with ancient, wood, glossy veneer, which had clumsy wiring running along it connecting the TV and fan. These walls were filled with anything but clear space – stickers, oily spots, handmade health and safety announcements, and even with a collage of CD covers. It was dimly lit and a poor reflection of the past times when these cabins were filled with the rich Dutch class of the early 20th century. Between the red columns in the middle of the public space the floor was filled with casual office chairs. They looked like they had been worn out for some time now and fixed up with duct-tape. Just like in Japan, Indonesian ferries have public floor spaces for lying down, but they have chair sections too. The chairs formed a row of three, which was perfect for sleeping passengers who were hesitant to lie on the floor. 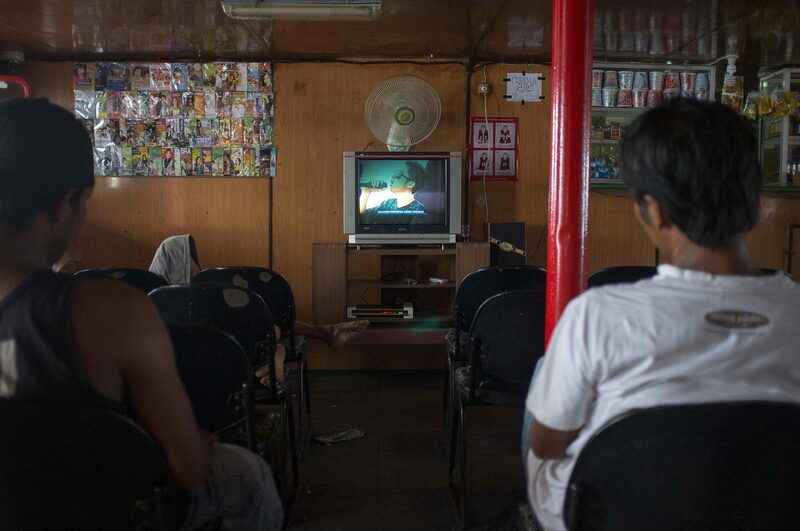 Those who were still awake moodily watched a popular Indonesian singer on the TV that was strapped to the wall. Public cabin with chairs, vendors and TV. 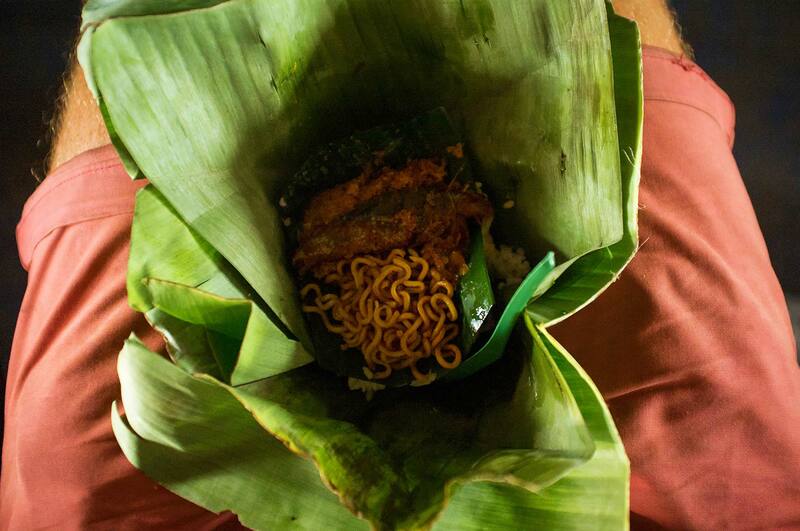 Noodles and fish wrapped in banana leaf. 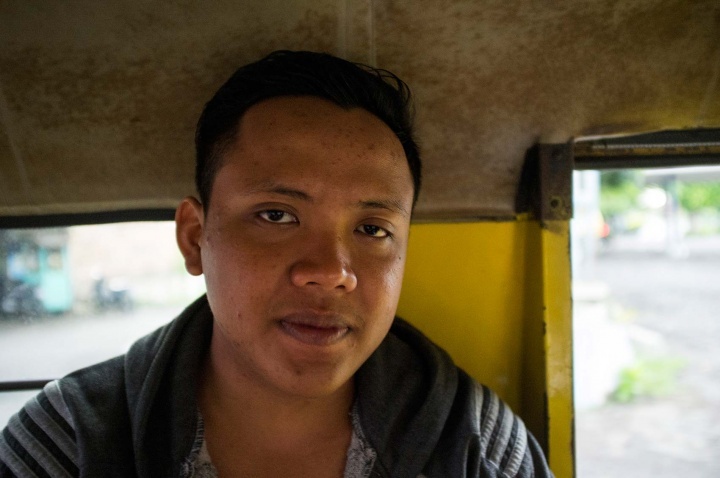 Public transport in Indonesia is flooded with vendors trying to sell treats to travellers before the transport departs. They offer everything from clothes to food and in general are very aggressive and pushy. The female vendor on the ferry, however, wasn’t persistent and was rather calm, she described what was on offer and passed me noodles with fish, wrapped in a banana leaf. I never post about food due to a lack of knowledge, but as a graphic designer what I found interesting is how Indonesians prepare and wrap food. Indonesian cuisine employs a banana leaf in cooking methods such as steaming, boiling and grilling. The leaves are large, flexible, and waterproof, and function perfectly as a traditional, disposable take-away food container, and when unwrapped are used as a placemat. Organic and environmentally friendly by nature. The 5km ride took 30min, which is equivalent to human running speed. I finished my meal just before we arrived to Banyuwangi. 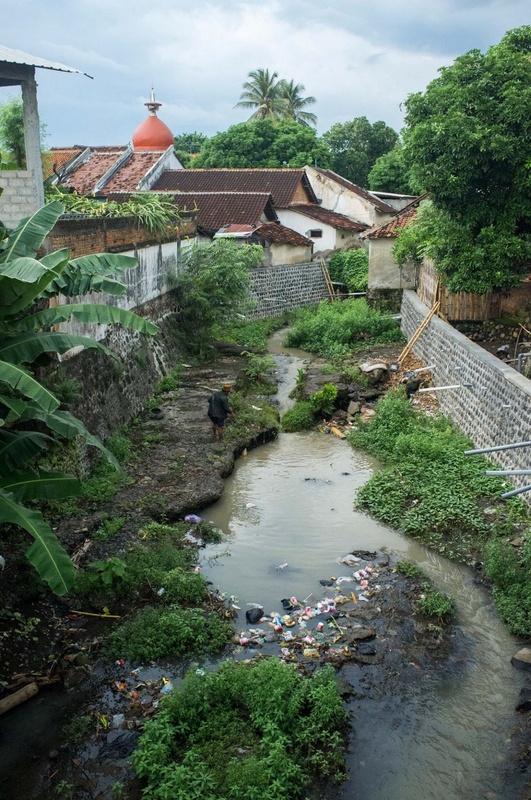 In Javanese Banyuwangi means “fragrant water“, and comes from a local tale. People here are known for their combination of Islamic and pre-Islamic traditions, they include Arab and Chinese communities. One of these is the Osing community, which followed a Hindu culture until they were forced to convert to Islam by the Dutch East India Company. Now they can be considered a Javanese sub-ethnic group. The Osing live mainly in the central part of Banyuwangi and sometimes consider themselves as Majapahit descendants (Majapahit Empire 13th-16th century). Other groups are Javanese, living mostly in the south and west, and Balinese concentrated in the east. After the Majapahit Empire ceased to exist it became an independent kingdom for a bit and the last Hindu kingdom of Java. However, in order to defend itself from the troops of the Javanese sultanate, Banyuwangi (then known as Blambangan) asked for help from the Balinese kings, which caused it to lose its independence to the Balinese kingdoms. During this time Banyuwangi was deeply influenced by Balinese culture and after around 150 years of Balinese rule, the Sultanate of Mataram finally gained control of the territory and renamed it Banyuwangi. It later fell under the control of the Dutch East India Company. Tourists come here from Bali, primarily to surf and dive, just like Kuta, for which Banyuwangi now holds the Banyuwangi International Surfing Competition. 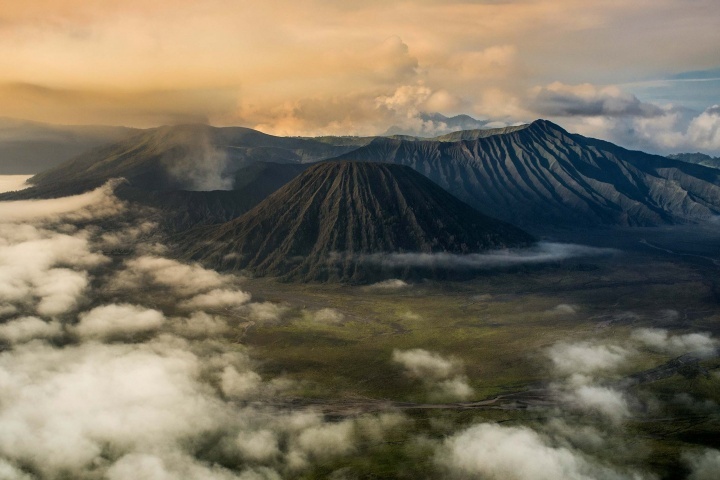 I, however, was heading to Kawah Ijen volcano while my fellow traveller Kharisma headed to Jogja, which he promised to show me one day.